What a defendant describes as the “criminalization of dissent” through retaliation by the Oxnard Police Department, prosecutors argued in court that this is simply a case of a community activist getting five jaywalking tickets during a protest march because he was recorded on video violating the law. The trial of Francisco Romerogot underway in Ventura County Superior Court on Monday. Romero was the only protestor to be cited for jaywalking where police testified that there were between 150 to 200 marchers. Romero claims he was singled out because he was one of the leaders who organized a march on Oct. 13, 2013 to protest the deaths of young men by police in Oxnard: Alfonso Limon Jr and Jose Zepedain Oct. 13, 2012. Before Limon was killed, Robert Ramirez Jr. died June 2012 under police custody, followed by the slaying of Michael Mahoney in August 2012. During opening statements in the trial, Romero’s lawyer Jaime Segall Gutierrez, of Whittier, California, told Commissioner Anthony Sabo, who is hearing the case, that Oxnard police are trying to “silence protests” against police slayings in Oxnard. “Law enforcements attempts in silencing the people’s voices has been in place since the founding of this country,” Gutierrez said. He said the protest was held after family members of Alfonso Limon contacted Romero’s group to organize a protest. Prosecutor Jennifer Sihn declined to make opening statements, telling the judge that the prosecution’s evidence will be sufficient. Evidence that includes five video clips that prosecutors allege show Romero leading and directing the crowd during the protest. 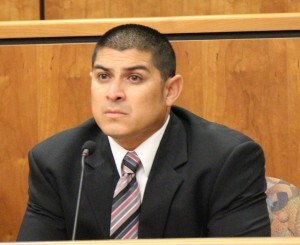 Sihn put two officers on the stand — Jaime Miranda andJess Aragon — who conducted video surveillance on the protestors. 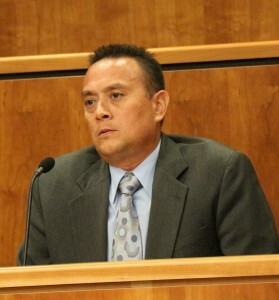 Gutierrez subpoenaed Oxnard police officers. Two of them —Jaime Brown and Alex Arnet— also testified Monday. The case has been in the courts for two years because of stop and start hearings in this case; unrelated and conflicting legal issues involving Commissioner Sabo’s court and other delays. Officers Miranda and Aragon, who were surveilling the protestors, denied that Romero was singled out because he is a leader. During the protest march, there were more than 90 Oxnard police officers, including undercover officers, police strike teams and SWAT units, who were assigned to maintain public safety. Police also brought an armored vehicle to the protest in case it was needed, police documents indicate. Uniformed police including Miranda and Aragon weren’t visible during the two-mile trek, which began at Camino del Sol Park and ended in front of police headquarters, court evidence indicated. The protest was peaceful. There were no arrests or traffic citations issued other than the five jaywalking tickets given to Romero. A briefing was held by the Oxnard Police Department before the Oct. 13, 2013 March where a “March for Justice Incident Action Plan” was given to officers. On Oct. 22, following the protest, the Oxnard Police Department’s Special Enforcement Unit held a meeting and surveillance video was reviewed for violations. A memorandum was written about the protest march. Romero was the only person who officers said they could identify among the protestors. Subsequently, a letter dated Oct. 29, 2013 was sent to his house that stated that he was being issued five jaywalking violations. Romero claims the tickets, which total $1,000 in fines, were given in retaliation for protesting against the Oxnard Police Department. He said the city of Oxnard has spent thousands of dollars in an “attempt to criminalize dissent. An attempt to silence the people who have lost fear in resisting, struggling and standing up” for their constitutional rights. Romero, who is one of the leaders with the organiztion Todo Poder al Pueblo, once ran for the Oxnard City Council and got 7,000 votes. Police have testified that the video recording proves that Romero was involved in leading the crowd to commit jaywalking that stopped traffic, including temporary blocking Oxnard boulevard while protestors crossed the busy street when the traffic light was green. Miranda testified that he and Aragon were in a vehicle surveilling the protestors, saying that he identified Romero and two family members of Robert Ramirez. Miranda said he included these names in his police report but doesn’t know why the two other protestors weren’t given jaywalking citations. He said he gave the police report to his superior Arnet. Miranda said he doesn’t know why Arnet only chose to give jaywalking tickets to Romero. “Did you ask,” Gutierrez said. Aragon said he was in the vehicle with Miranda but at one pointed got out of the vehicle and stood on the Third Street bridge to video record. He said he didn’t know who Romero was until Miranda told him. “He just appeared to be one of the leaders,” Aragon testified. He denied that they were targeting Romero or that they had been told by superiors to do so. Aragon said police officers were trying to provide security for the march and keep people safe. Officer Jaime Brown said he mailed the Oct. 29 letter to Romero after a “careful review” of the videos showed Romero “helping people across the street,” waving his hands and “standing guard” during the protest march. “Did it look like my client was helping keep safe the marchers?” Gutierrez said, noting one video. He said he had been a police officer in Oxnard for 18 years when the oct. 13, 2013 protest took place. He said there were about 200 marchers. “I didn’t know who Romero was. I couldn’t ID anybody,” said Brown. Brown said there were safety concerns for the participants and motorists who were on the roads where the protests were occurring. He said if a motorist wasn’t paying attention, a protestor could have been killed. Officer Alex Arnett testified that he was the supervisor of the Mobile Surveillance Unit . He said seven police officers were assigned to that unit to work on the protest march. He said he reviewed Miranda’s police report with three names on it including Romero’s name. “Did you notice the names on the report?” Gutierrez said. “I don’t recall that,” he replied. Arnett said he drafted the letter that Brown reviewed and signed. Arnett said other people in the report weren’t given traffic tickets because of the “totality of the situations” and that Romero organized, directed and lead the protestors. The city of Oxnard has had to pay millions to settle one wrongful death lawsuit, and most recently, a federal jury ruled against Oxnard in another wrongful death suit. In June, a federal jury awarded the family of Robert Ramirez $2.9 million as damages as a result of a wrongful death lawsuit filed against the Oxnard Police Department. Ramirez died while under police custody and after ingesting methamphetamine. The county medical examiner determined that the cause of death was homicide by asphyxiation. The shooting of Alfonso Limon resulted in the city of Oxnard having to pay $6.7 million to settle the wrongful death lawsuit filed by Limon’s family which is the largest wrongful death settlement for the city of Oxnard. Witnesses saw police shooting Alfonso Limon several times and frantically yelled at police to stop because he was unarmed. A witness recorded the incident through a cell phone camera. The trial resumes at 1:30 on Tuesday. 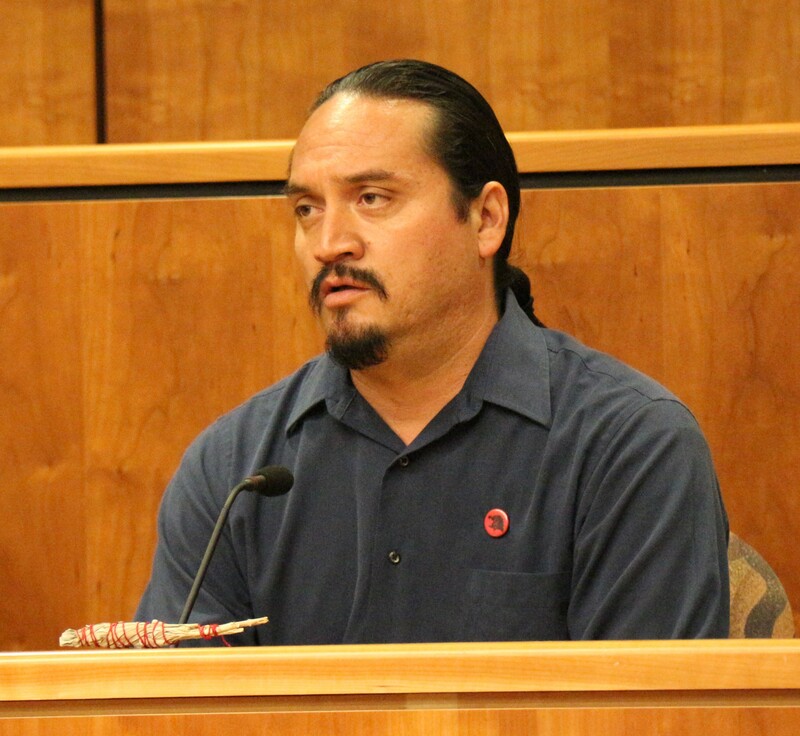 The two-day trial of a community activist who claims that Oxnard police targeted him to stifle criticism about police abuse and brutality ended Tuesday with closing arguments by the prosecution and the defense. 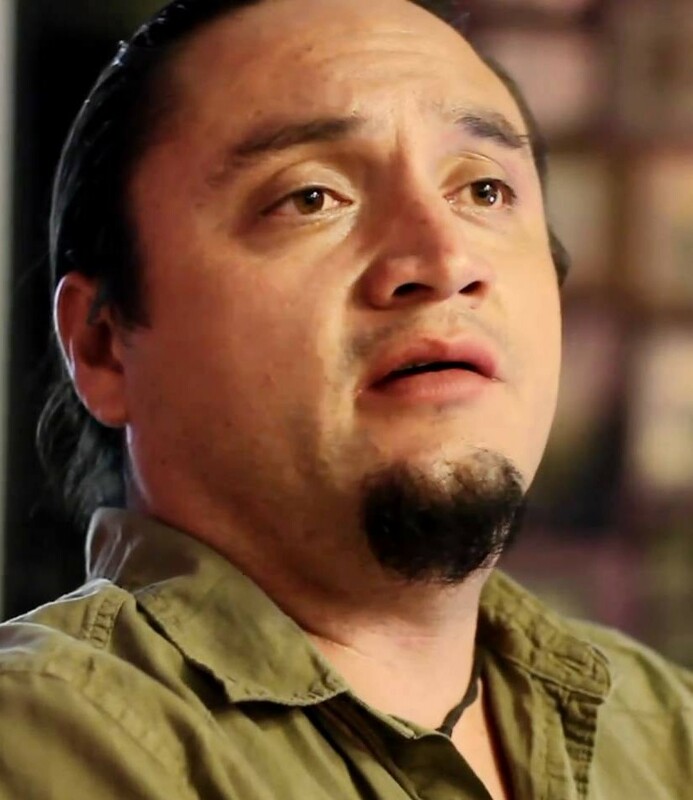 Francisco Romero got five traffic citations for jaywalking during a protest march on Oct. 13, 2013. The protests were for young men who were killed by police: Alfonso Limon Jr and Jose Zepeda in Oct. 13, 2012. Before Limon was killed, Robert Ramirez Jr. died June 2012 under police custody, followed by the slaying ofMichael Mahoney in August 2012. The October 2013 protest was peaceful, there were no arrests or injuries, and nobody else got any traffic tickets with the exception of Romero, court testimony indicated. Police and others testified that the marchers numbered from 150 to 200. They said Romero was the only one who got the traffic tickets because they couldn’t identify other marchers. Prosecutors argued in court that Romero violated traffic laws, and these violations were recorded on video. Commissioner Anthony Sabo who heard the case, told the lawyers that he will making a ruling later after looking at all the evidence. 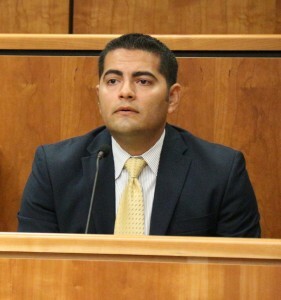 During closing arguments, Deputy District Attorney Jennifer Sihn told Sabo that Romero was caught walking against a red traffic light, walking between vehicles and standing in the middle of the street as cars stopped or drove by. Sihn went through the five police video clips pointing out the alleged traffic violations. 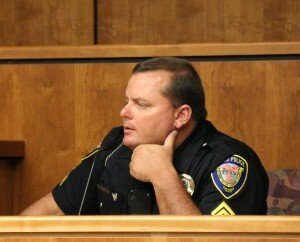 Romero’s lawyer Jaime Segall Gutierrez, of Whittier, California, told Commissioner Sabo that police targeted Romero because he represents an “articulate and charismatic voice” for many people in the community who are “sick and tired” of police abuse, killings and misconduct that goes on in Oxnard. Gutierrez said Oxnard is trying to “chill” First Amendment and other constitutional rights. Gutierrez said it is “unbelievable” that Oxnard police couldn’t identify anybody else from hundreds of people who participated in the protest march. In a police video, Officer Jaime Miranda, who was doing surveillance on the marchers, is heard saying, “There is Romero. There is Romero,” Gutierrez said. Miranda testified Monday that he also wrote in his police report the names of two other protest marchers — Elliot Gabriel and Guillermo Ramirez, a family member of Roberto Ramirez. Miranda said he didn’t know whether his supervisors were aware of the two other names in his report or why they didn’t ticket others who were violating traffic laws. The jaywalking case has been in the courts for two years because of stop and start pre-trial hearings in this case; unrelated and conflicting judicial matters involving Commissioner Sabo’s court and other delays. Testimony indicated that a briefing was held by the Oxnard Police Department before the Oct. 13, 2013 March where a “March for Justice Incident Action Plan” was given to officers. Subsequently, a letter dated Oct. 29, 2013 was sent to his house that stated that he was being issued five jaywalking violations, noting that he was leading and organizing the march. Romero, who testified at his trial, claims the five tickets total $1,000 in fines. 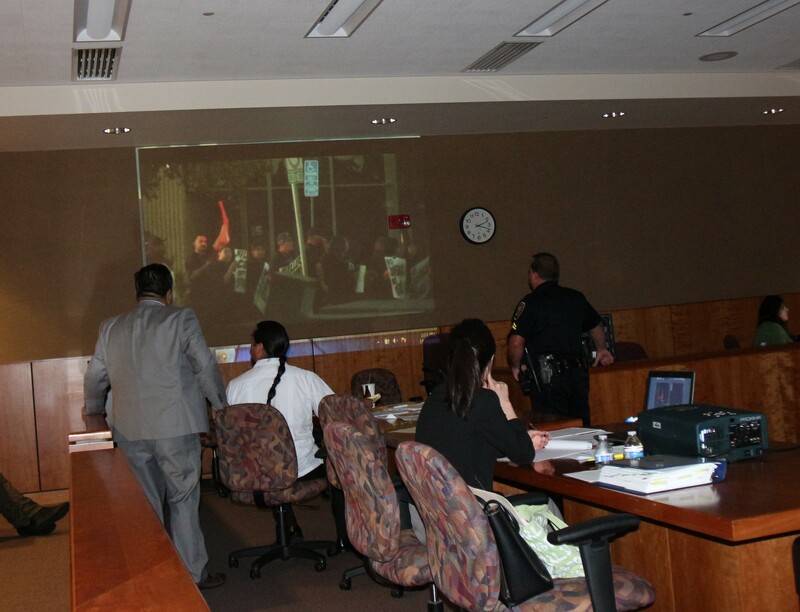 Police testified that the video recordings prove that Romero was involved in leading the crowd to commit jaywalking that stopped traffic, including temporary blocking Oxnard boulevard intersection while protestors crossed the busy street when the traffic light was green. They denied singling out Romero, testifying that they were concerned about the safety of the protestors and motorists. 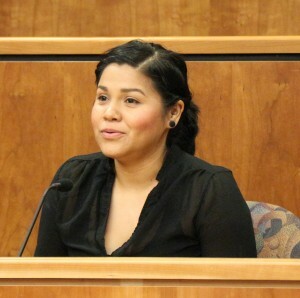 Tuesday, an Oxnard assistant police chief along with the sister of a man gunned down by police, and Romero took the stand. 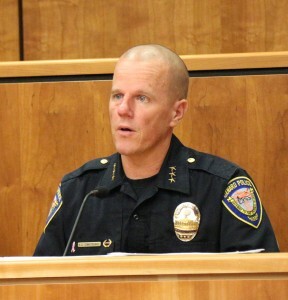 Oxnard Assistant Police Chief Eric Sonstegard, who was the commander of the Special Operations Division in October 2013, testified about the “Incident Action Plan” and the police briefing held to plan for the Oct. 13, 2013 March. Sonstegard said he couldn’t recall whether Romero’s name came up during the briefing. During the protest march, there were more than 90 Oxnard police officers, including undercover officers, police strike teams and SWAT units, who were assigned to maintain public safety, according to police documents. Police also brought an armored vehicle to the protest in case it was needed, police documents indicate. Sonstegard said there were actually 25 to 30 officers assigned to work the protest march and the rest were on standby or working regular patrols. They would be used if needed. He said he didn’t tell officers to target Romero. Sonstegard said he never saw the videos, and the decision to cite Romero was made by other commanders. Sonstegard said he never gave the command to order protest marchers to disperse because as soon as this is done, there is usually confrontation, and he was concerned about women and children who were participating in the protest march. He said it is “inherently dangerous” to stand in the middle of Oxnard Street like Romero. Sonstegard said he didn’t believe Romero was facilitating the march and trying to keep the protestors safe while they navigating through the streets. The sister of Alfonso Limon,testified that they contacted Romero to organize an anniversary protest march for her deceased brother. Claudia Limon said Romero made it clear that the Limon family was in charge and would decide what streets they wanted to use. Claudia Limon said Romero tried to keep the marchers safe, away from traffic and keep cars at bay. She said Romero was being targeted by police because her family members were there along with members of Ramirez’s family. She said police could identify the family members. “They know our families,” she said. The 39-year-old Romero testified that he works as a paralegal and has been involved in community organizing against police brutality for 18 years. He said he has been involved in 50 marches. He said he has lived in Oxnard 38 years. Romero, a former educator, said he knew Alfonso Limon and Roberto Ramirez who was his student at Haydock Intermediate School in Oxnard. He said he didn’t lead the march but was trying to keep marchers safe while crossing the streets. Romero, who is a member of Todo Poder al Pueblo, testified that he was one of the facilitators of the march. During his testimony, he used the police videos and a map to give details of what he was doing during the march. He said police were definitely targeting him. Romero said the Limon and Ramirez families offered to give him $1,000 to pay the jaywalking tickets but he declined to accept the money, saying he regards the tickets as a challenge to his right to protest. Under cross examination, Romero said throughout the march there was danger at every intersection. He said police never issued an order to disperse, and the marchers would have done so as planned. In March, 26-year-old Meagan Hockaday of Oxnard was killed by Oxnard police. This entry was posted in Brutalidad Policial // Police Brutality, En Las Noticias // Media Coverage, Luchas sociales y solidaridad // Social Struggles & Solidarity, Notas de prensa // Press releases. Bookmark the permalink.